As I was updating information on herbicide resistant weeds for class this week, I wanted to find some hard numbers on the large-scale impact herbicide-resistance can have. Obviously, my first thought was to find information on cotton production in the South. Glyphosate-resistant Palmer amaranth has been something of a poster child for the potentially devastating impacts of herbicide resistant weeds in the last few years. It has been dubbed a “superweed” by many, including Nature News, the New York Times, and various trade magazines. It has even been said to “threaten the sustainability of cotton production in the southeastern United States.” This herbicide-resistant weed has been so devastating that it has garnered national attention by people far removed from agriculture. Certainly, a problem of this magnitude must be causing damage that could be captured on a regional or even national scale. 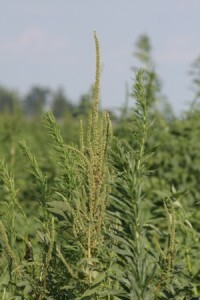 The first case of Palmer amaranth resistant to glyphosate was documented in 2004 in Georgia, and it has since been documented throughout much of the South and several states in the Midwestern US. The most discussed impacts of this weed, though, have been in glyphosate-resistant cotton fields of the South. 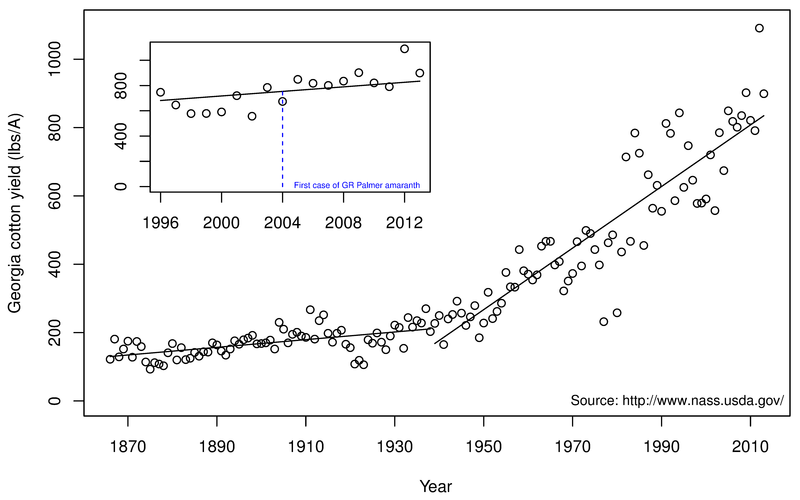 With this in mind, I decided to take a look through USDA-NASS cotton yield data to see how much cotton yield had decreased in the decade since glyphosate-resistant Palmer amaranth was first documented. My plan was to use the cotton yield data to illustrate to my weed science students how dramatic the impact of herbicide-resistant weeds could be. 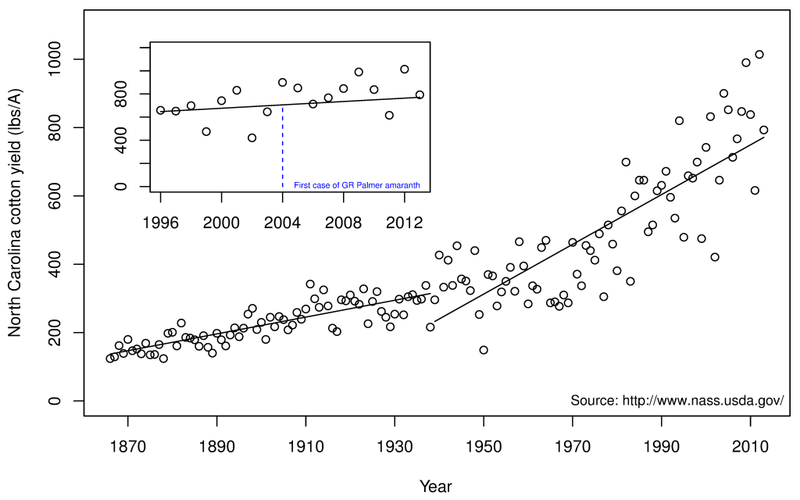 From the beginning of the NASS data set to around 1938, there is a very slow increase in cotton yield. Beginning in around 1939, however, we started to see a dramatic improvement in cotton yield per acre. 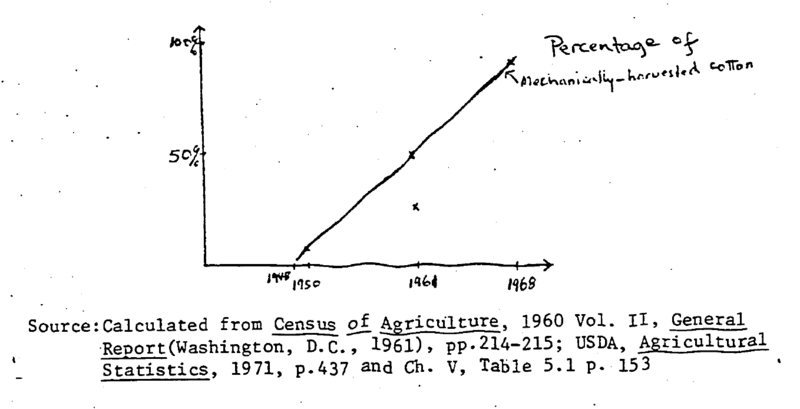 Mechanization of cotton harvest may have been a factor around this time. I am not a cotton expert, but I imagine the sustained increase in cotton yield between 1939 and today is due to a combination of factors, including mechanization, availability of synthetic fertilizers, insecticides, and herbicides, and genetic improvement in the form of new cotton varieties. 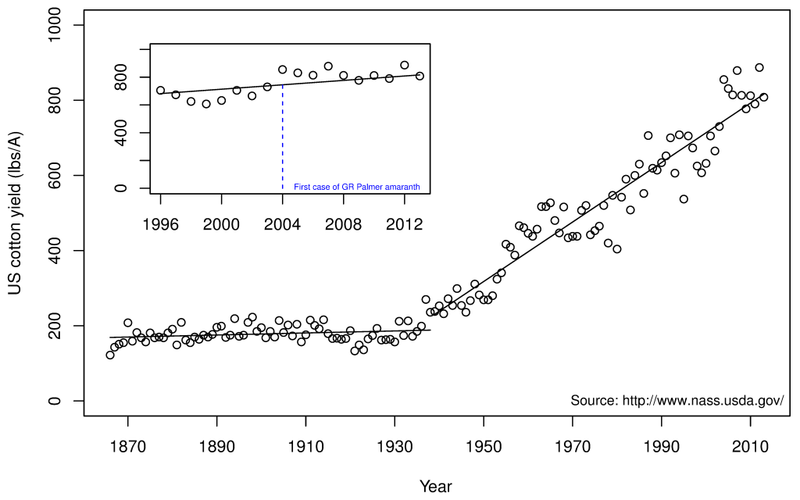 Between 1939 and 2013, cotton yield in the US increased by an average of 7.9 lbs/acre/year. But what I was really interested in is the impact of glyphosate-resistant weeds. 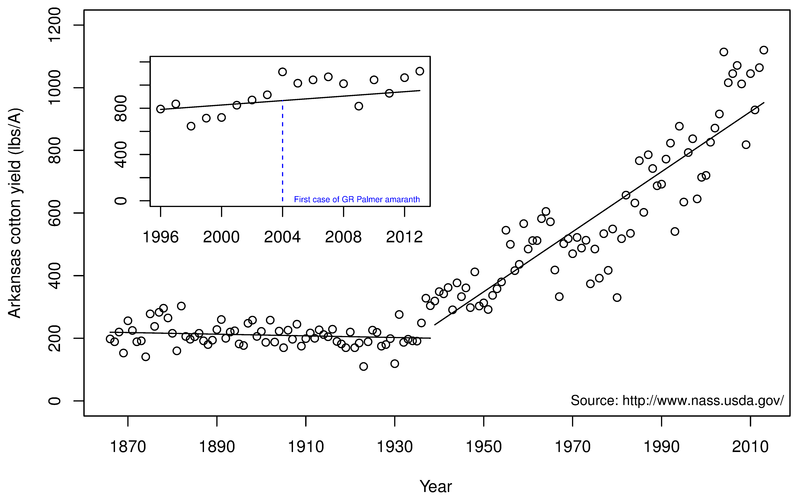 If cotton yields were negatively affected by glyphosate resistant weeds on a large scale (as implied by many media reports), I would expect to see a decline in cotton yield some time after the confirmation of glyphosate-resistant Palmer amaranth in 2004; or at the very least we might observe yield falling below the long-term trend. The inset plot shows the same trend line (7.9 lbs/acre/year), but zoomed in on the period from 1996 to 2013 to more easily see the time frame of interest. The results are really not what I expected. Since 2004 (the year glyphosate-resistant Palmer amaranth was discovered), cotton yield in the US has been above the long-term trend 7 out of 10 years. This seems contradictory to the compelling narrative of the devastating superweeds that are eating up the South; but perhaps the scale was simply too large. Using national data may be washing out the impact observed in the affected states. After all, cotton is produced in several states less severely affected by glyphosate-resistant Palmer amaranth, including California, New Mexico, Arizona, and Texas. So I looked specifically at the “epicenter” of glyphosate-resistant Palmer amaranth: Georgia. Georgia is where this “superweed” was first discovered, so I presumed that state would be the most heavily impacted. But cotton yields in Georgia looked very similar to the national data; since 2004, cotton yield was greater than the long-term trend 8 out of 10 years. Next I looked at North Carolina and Arkansas, simply because glyphosate resistant Palmer amaranth was discovered there soon after the discovery in Georgia. And again, cotton yields have mostly exceeded the long-term trend. Since the discovery of glyphosate-resistant Palmer amaranth, arguably the most damaging of all the so-called superweeds, cotton yield in the affected states continues to increase. I have no doubt that even after weeds evolve resistance to many different herbicides, farmers will still find ways to manage them. It might be less simple than it was a couple years ago. But I don’t think they’ve lost the skills necessary to do it. I think the cotton yield data are strong evidence that I was right. In the battle between farmers and superweeds, I’m putting my money on the farmers. In the face of herbicide-resistant weeds that “threaten to overgrow U.S. fields,” the cotton farmers in the South did nothing more than increase yield. And that is a compelling narrative that has some data to support it. Previous Article Do cultural and mechanical weed control practices delay development of herbicide resistant weeds?